ASHRAE Fundamentals Handbook has a methodology for calculating the friction loss in ducts and fittings. Based on these formulas, Dryer-Ells can be measured the same as straight pipe. This permits use of the maximum allowed run length. A ten inch radius smooth interior ninety degree bend will only have an equivalent vent length of 1-1/2 feet (the same length as model LT90). A ten inch radius smooth interior forty-five degree bend will only have an equivalent vent length of 3/4 feet (the same length as model LT45). 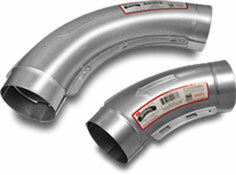 The pressure loss through a fitting is often calculated by establishing the equivalent length of duct for each fitting. By using this method of calculating duct pressure loss, the equivalent length of each fitting is added to the total duct length to establish the pressure loss through the duct system. A standard three section, 4 inch dryer exhaust duct 90° elbow with a 4 inch radius has been established as having an equivalent length of 5 feet in Section 504.6.1 of the 2003 ICC International Mechanical Code and Section M1501.3 of the ICC International Residential Code. The coefficient for a three section elbow in SMACNA Duct Design Handbook is 0.42. Rounding up, the 4 inch smooth 90° elbow with a 10 inch radius would have an equivalent length of dryer vent of 1-1/2 feet.